Stated simply, some of the automotive brake lines currently on the market are downright frightening. Looking at the fitting and assembly quality makes you wonder where the parts came from, and who put them together. Low grade carbon steel fittings, sloppy stainless weave, no abrasion coatings, substandard linings…the list goes on. When you consider that your brake lines are the critical safety link between your foot and your calipers, these facts aren’t exactly comforting. Not only are some of these parts suspect, it can take forever to actually receive them after placing an order. Spiegler does things a little differently. While you may not be familiar with the Spiegler name, they’ve been a trusted producer of stainless steel brake lines in the motorcycle racing industry for some time. Every component in a Spiegler brake line is manufactured to exacting standards in the USA or Western Europe, and these premium components are then hand assembled and tested at Spiegler’s facilities in Dayton, Ohio. 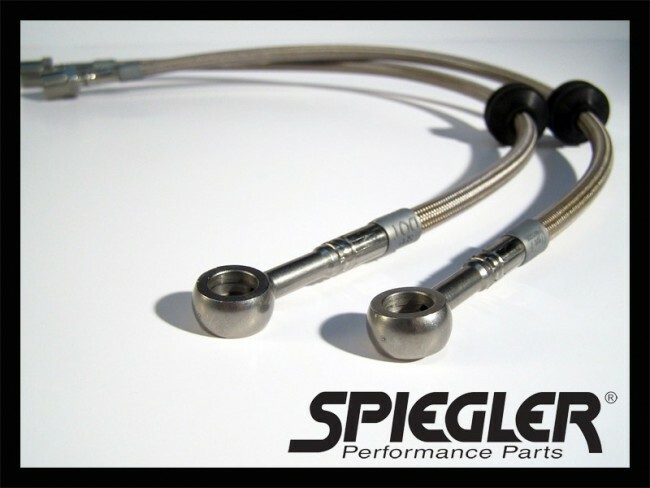 You can buy Spiegler Stainless Steel Brake Lines with confidence, knowing that you’ll be receiving the finest product available for your car. You’ll also receive your parts quickly. Spiegler ships all standard production parts within 48 hours from the time of order. When you have a track day on the horizon, you know you’ll have your parts in time to install them. If you’ve ever installed a set of brake lines on your car, you’ve likely run into issues when trying to get the lines in proper orientation with the calipers. In order to be installed without any unwanted tension or stress, the line may need to be routed in a certain direction or angle with relation to the brakes and suspension. As you screw the banjo bolt into the caliper, the banjo fitting inevitably starts to rotate along with the bolt. You counteract this effect by pre-setting the line in a position counterclockwise of where you want it to actually end up, and then rotating it into position as you tighten the banjo bolt. This is called ‘clocking,’ and it can be a tedious affair. Once you have the line tightened down, you’re done, right? Not exactly. While routing the brake line to the hard line attachment point, it’s very easy to introduce some twist into the line. That means you’re generating tension and strain on the line. When you turn your front wheels or go over a patch of rough road, that stress can be enhanced greatly. Most brake lines don’t have a solution for this dilemma. Spiegler lines fortunately do. The unique Spiegler Torsion System on the banjo fitting can be rotated, allowing for the removal of any unwanted tension in the line. Pop the line in your vice, give it a twist, and it’s much easier to position the line. These unique fittings allow for a cleaner install with less stress on the line, which means less chance of the line rupturing, or having unwanted contact with a wheel or suspension component. All Spiegler Stainless Steel Lines come with an abrasion resistant coating. On the standard parts (non-custom colors), that coating is clear so you’re able to see the underlying stainless weave. The abrasion resistant coating prevents the line from snagging, protects the stainless weave from debris, and also allows the line to slide smoothly through any required retainers or brackets for a given application. When you drive your car in an environment as harsh as a racetrack, they’re constantly under assault from heat, tire debris, rocks, dirt, etc. In these conditions you need a high quality brake line designed to cope with these hazards. Spiegler lines are built tough, using aircraft grade stainless steel fittings and hardware. These components form the glue that holds the brake line together. Spiegler is so confident in the strength of their lines that they went so far as to dangle a sport bike from one of their brake lines (see above). The devil is in the details. Take a look at the Spiegler line above on the left, compared to competitor lines on the right. Which would you prefer on your car when approaching a turn at 150mph? Spiegler lines are made from domestically sourced, heavy gauge, densely woven stainless steel braid. The result is superior pedal feel, strength, durability, and safety. Spiegler lines are made with proven, durable components you can rely on, such as a DuPont Teflon® inner lining. Every Spiegler line complies with Department Of Transportation guidelines for automobile brake lines, so they’re perfect for your road legal track car or daily driver. If you have a show car, or just want something a little more colorful behind your wheels, Spiegler offers a range of custom color options. Please allow 7 days from date of order for production of colored brake lines. A lot of companies talk a good game about their “extensive testing,” but not many can back that up when push comes to shove. Spiegler makes it a priority to conduct a full battery of pressure, whip, and strength tests on their lines. Spiegler also wants its customers to be completely satisfied with their products, and offer a lifetime warranty against defects in manufacturing and workmanship.